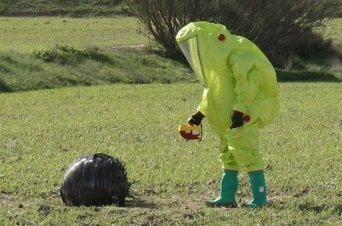 Inexplicata-The Journal of Hispanic Ufology: Spain: Not a UFO, Just "Space Junk"
Guardia Civil placed under alert after two shepherds discover a grey sphere that gave off heat and was surrounded by a small crater. Madrid/Murcia (Sara Barderas) - Francisco and Juan Espin, sibling shepherds from the Murcia region, were nonplussed to see that object in the middle of the field where they kept their sheep and goats. The greyish orb gave off heat and had formed a small crater around itself. They had never seen anything similar. "This must've fallen from the sky," they said to each other, according to Murcia's "La Verdad de Murcia" newspaper. There were no footprints around it, indicating that no one had deposited at that location, traversing a muddy road. The young shepherds, ages 27 and 25 respectively, took out their cellphones to photograph and record the object, sending images to their friends to see if anyone had any idea. In the meantime, they touched it and tried to move it. It weighted 20 kilos and had a diameter of 70 centimeters. "It had a sort of valve on its upper section and appeared to be sheathed in something like fiberglass. We'd never seen anything like it," they told the local press. Since Tuesday, the strange sphere has been featured in the conversations between locals of Los Llanos del Cagitán in southeastern Spain. It has become a headache not only for the shepherds, but for the army, police and Guardia Civil. The Army had been engaged in maneuvers for a number of days in the vicinity, and the first thought to cross they shepherds' minds was that it could be part of some military vehicle. But the military itself dismissed the likelihood when asked for an opinion. It was then that the Police and Guardia Civil entered the scene. Agents of the latter, wearing anti-radiation gear of the kind depicted in movies, created a perimeter and activated the NRBQ protocol (nuclear, radiological, bacteriological and chemical). Specialists from the Explosive Artifact Deactivation Group (GEDEX) also reported to the scene. Things were getting serious. Having analyzed the object, the likelihood of its being radioactive and containing explosives was dismissed. A conclusion was finally reached: everything suggested that it was a spare fuel container from a space rocket. This is not the first time one has fallen to earth. Space junk is a problem and space agencies have been seeking solutions for some time, both to follow its trajectory and to eliminate it. Even particles measuring a few millimeters can cause serious damage, turned into bullets due to the velocity achieved in orbit. NASA's Madrid tracking station and the European Space Agency (ESA) were advised of the event. Ivan Moya Sanchez, a 24-year-old community manager and brother-in-law to the shepherds, had reached a conclusion on his own that was similar to that of the Guardia Civil. Cross-checking photos and videos on the Internet, he found photos of a similar sphere that fell in South Africa in 1962 and was from a NASA Atlas booster. "The sphere has the looks of being a gas pressure vessel (COPV), possibly from some space station. These objects are made of a material so resistant that they survive reentry nearly intact, and [even survive] catastrophic explosions," said the young man. Tests have concluded that there is no environmental or health hazard for people in the rural area. "The UFO that fell in Murcia on Tuesday was neither alien nor rainproof. It was just space junk," the Guardia Civil wrote on Twitter early this morning. "It was clearly from a rocket, since it plummeted to the ground.